Here is a neat little trick that I have not seen many people using. It’s obvious yet I’m struggling to understand why it’s not being used more often. On smart phones (iPhones and Androids using the Chrome browser), phone numbers in the search result’s description for Google and BING are clickable and will place the phone number in the phone’s native dialer. 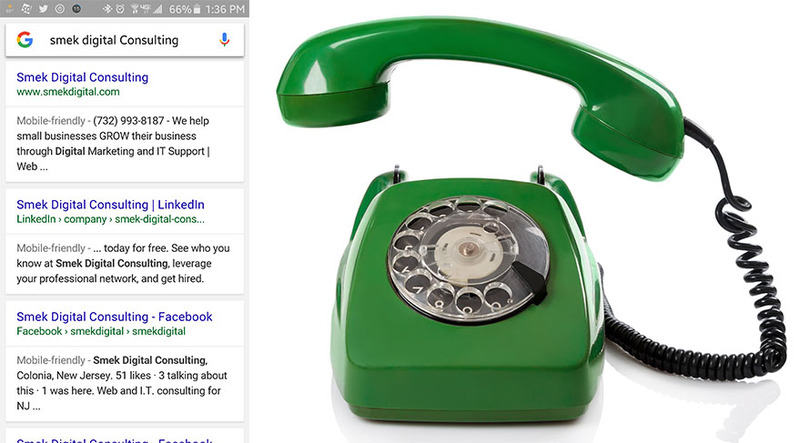 On desktops using Chrome browser, the phone numbers in Google’s and Bing’s SERP result’s description are clickable if a VOIP messenger program is installed such as Skype or Google Voice. Since the meta description tag is not DIRECTLY a SEO factor, NOT having the focus keywords in the beginning of the meta tag content does no direct SEO harm. However, it does seem that the phone number in the meta description tag needs to be in some sort of format to become clickable. The example below from merchantcircle.com contains the phone number but it is NOT clickable. At first I thought placing the phone numbers in parentheses was the trick, but the McDonald’s result proves that to be incorrect. NOTE: Clickable phone numbers seems to only work in Chrome browsers for Google and BING. I’m unable to test every o/s & browser at this time. Yahoo also does not seem to use the meta description tag as it just grabs random text from my homepage. Since Chrome is taking 34% of global market share and desktop Chrome users account for 51%, it might be worth implementing this. If anything, having a phone number near the beginning will make your result stand out from the rest easier. Users are searching for basic information for businesses ‘NAP’ (name, address, phone number) all the time. It would probably benefit businesses such as local plumbers, restaurants, and taxi companies the most. How many times have you forgotten the phone number of your local business? If it makes it easier and quicker for customers to call you, why not? Even if it’s not clickable on other browsers, it allows fast access to your number.